Please schedule your appointments by calling 360-493-2586. Feel free to leave a detailed message at any time. Informed Consent. All of my clients are asked to carefully read and sign this form. I am happy to answer your questions before asking you to sign it. Canine History form. 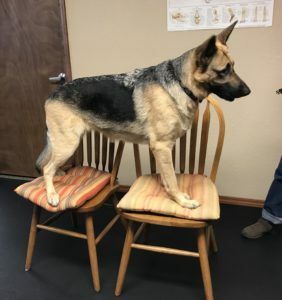 This information helps me understand your dog and your goals for your dog, which helps me give your dog (and you) the best service possible. Photo Release. I like to post dog client photos on my Dogs in Action Facebook page. I will not post a photo without your prior consent. If you are willing to have your dog star on my page, please complete this form. Veterinary Approval letter. 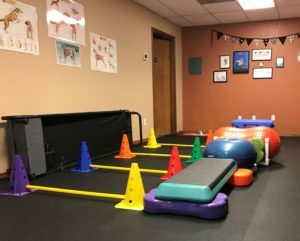 If you want your dog to see me because of a surgery or an injury, I will need approval from your veterinarian for your dog to participate in an exercise program. This form is an example; your veterinarian may use his/her own words. You may e-mail completed forms to me at GetFit@DogsinActionOlympia.com. You may FAX completed forms to 360-455-1318. You may mail them to 3929 Martin Way East, Suite E, Olympia, WA 98506. Serenity deciding that chairs were more fun than the floor! 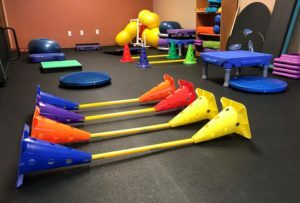 Imagine your dog having fun here . . . . 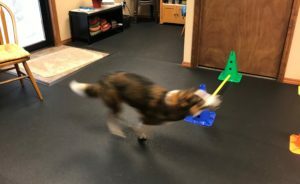 Call now to schedule time to have fun with your dog!